Day 16 out of 183. Behold what I drew today....this character is a combination and exaggeration of the two teachers I truly despised back when I was in grade school and early high school. Surely everyone has had a teacher that they did not like. Well I remember that these two teachers well and truly embarrassed me in class and I didn't do anything wrong. I had a strong american-ish accent even at a young age and it was stronger than the accent of my native language and this one teacher really picked on me for it. Needless to say I was very happy to leave for Australia and I had a great time in high school and college here and speaking English all the time. I still get asked about my accent constantly but I no longer get abused or ridiculed for it. Then there was the sewing teacher that gave me a stomach ache every class. She was a horrid and scary woman. This was done with pencils and Photoshop. 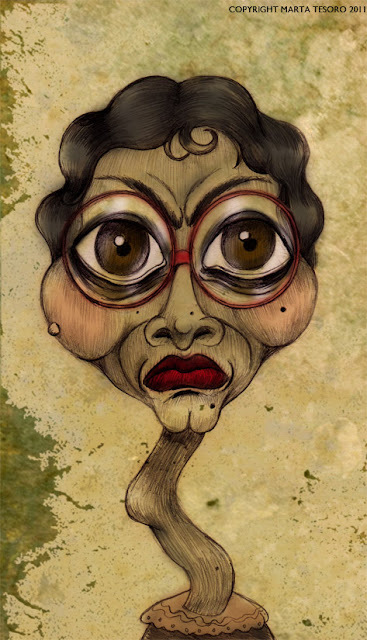 You have truly, brilliantly captured the essence of every bad teacher that ever was---evil creatures that they are. SO well done!! Yikes! Oh my, she does look daunting! I love the moldy, bloody color scheme too. I hope you had your share of good teachers as well as the demonic sort! Wow, my english teacher looked just like that! I've had some brilliant teachers, in fact, I blame my favourite teacher who taught me maths for being a geek now :) but there were some horrid ones, and the one that I remember most clearly even now is my history teacher, she put me off wanting to learn about history for a long time.